Donna Phelan back again, this time I would like to share a little project with you. I found this sweet little wooden tote at my local craft store for $1. I knew with a little Designer Paper and some wonderful dies from the Dies R Us Store I could transform it into something fabulous. I think I was right! First I painted it all white and covered it in pretty pink and white Designer Paper, wrapped a pink pleated ribbon around the top and added white sparkling glitter to the handle......and then the FUN began. I sorted out a bunch of dies I wanted to use and started cutting. I started with this sweet little Picket Fence by Amy Design and moved right on to the Curly Words Celebrate by Die-Versions. Let me just tell you how impressed I am with this wordy die. It's fancy and delicate and perfect for....well for ANY celebration! Here I layered a pink and white cut together so it would POP and add a bit of dimension. Next up came some of my beautiful foliage. In the 1st photo you will see the fantastic Ivy Corner Flourish by Cheery Lynn. I also used the Foliage 1 die from Paper Smooches. And for my final selection, I created a beautiful butterfly. Butterfly #2 Set from our very own line Dies R Us Dies. This set is awesome as it has five....that's FIVE different butterflies included. I layered 3 different ones together in the deep pink and light pink card stock and topped with a Vellum one. WOW! Oh Donna, this is so gorgeous, I'm without words!! I love the poinsettia's used on a spring project. So out of the box and fun! This is a true work of art and your mom will love it! Great use of dies all on one very meaningful project for your Mom. Only the best for the best! The colors make it look so summery and I have to get the congratulations die now that I see it. Oh my goodness, you would never know this was a $ tote, it is just Beautiful!!! I love when we can use our flower dies year around!! Love how you added the greenery too and the picket fence was the perfect thing to top it off, your mother is going to LOVE it!!! How lovely is this Donna. You have put so much into it, it's a true work of art. I love how you've used the poinsettia die for the spring flowers, and the greenery is fabulous, they both look perfect. Your Mum will love it, I'm sure. 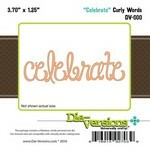 Great tip with the sentiment die, you have really made it pop.